The First Miller Lite Bowling tournament from 1982. 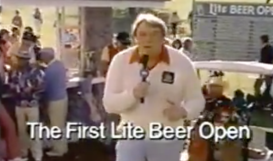 This is a good one that has that line that I always remember as a kid watching ..
Here’s a commercial for Miller Lite – “The First Lite Beer Open”. Featuring John Madden, Rodney Dangerfield, ..